Step 1: Install MzAccount.apk (Below zip file provided) in your flyme device. Step 2: Goto Settings -> (Scroll down to) Flyme Account -> Login with your flyme account. Step 4: Reboot the phone once. Step 1: Install & Open "SuperSU" (PlayStore Link: SuperSu) Android application. 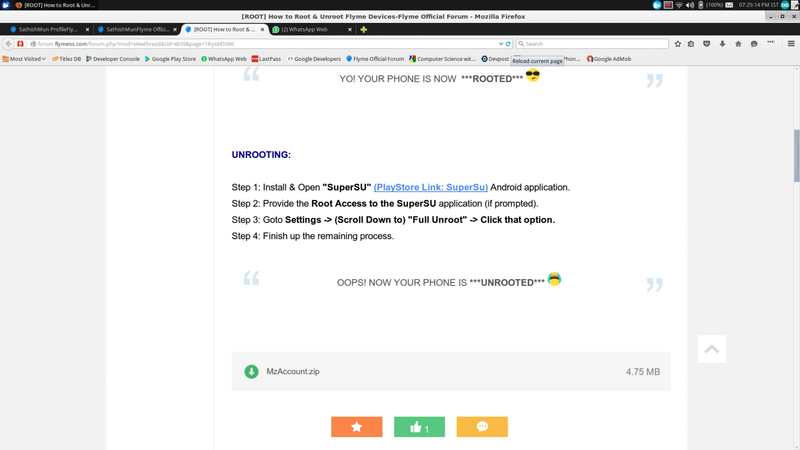 Step 2: Provide the Root Access to the SuperSU application (if prompted). Step 3: Goto Settings -> (Scroll Down to) "Full Unroot" -> Click that option. Step 4: Finish up the remaining process. User106260 ...： how the zip wioll be unzipped ?